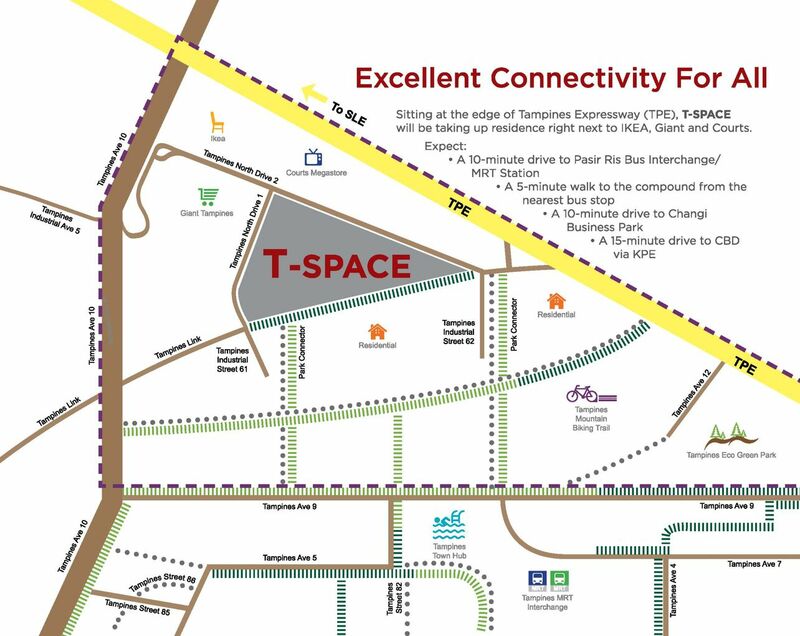 T-Space at Tampines North Drive 1 (Plot 1) is a new launch industrial project by Goldprime Land Pte Ltd, a unit of listed Lian Beng Group. Its bid of nearly S$64.39 million or S$87.34 psf ppr was the highest of five bids the site garnered at a tender that closed on Nov 24 last year. The 30 years leasehold strata factory at Tampines North Drive 1 has a land size of 2.7 hectares with a plot ratio of 2.5. The project will consists of 249 industrial units, 1 canteen and 1 heavy vehicle park. Located right next to Courts, IKEA and Giant Hypermart, future staffs have plenty of shopping and dining options all within a short walking distance away. For those who drive, they can enjoy free parking at the nearby car park from 7am to 11pm. The industrial project is estimated to launch March 2016. T-Space is a B2 (Light & General Industries) industrial project with a tenure of 30 years from 20th March 2015. The district 18 project is expected to TOP in 31 January 2019. Beside having various sizes for the industrial units, there are also recreational facilities for the staffs to enjoy a balanced work & play lifestyle. Some of the communal facilities are swimming pool, multi-purpose room, multi-purpose courts, fitness corner, pavilions and BBQ pits. The mainenance fee is expected to start from $200+. There are different types of units to cater for different users in T-Space. The Terrace Collection, are 4 storey units with 3 mezzanine and comes with private lift. The Studio which are single storey units with mezzanine. Courtyard units are double storey units. And typical single storey units. There will be be 3 service lifts and 5 passenger lifts serving the development. The heavy vehicle park has 185 heavy vehicle lots, will be located at level 5. For more information on T-Space, simply fill up your details below and our salesperson will get in touch with you shortly!